Sinclair’s work is concerned with dispelling myths, examining popular notions of Scottish culture, and attempting to reclaim from them what is ‘real’. 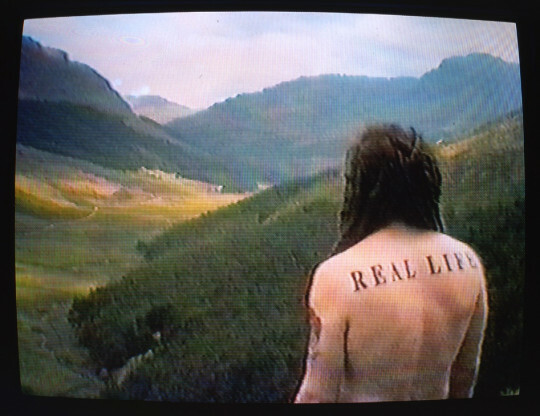 In the video the artist sits in the idyllic Scottish landscape of the Isle of Eigg, with his tattooed back to the camera displaying the words ‘Real Life’ and singing a medley of traditional Scottish songs, mostly referring to the love of the homeland. This is at once an affectionate homage to the genuine beauty of the Scottish landscape and, in his Friedrichian pose and the compositional structure, to the Romantic landscape tradition.